Everyone knows that collisions involving big rig trucks frequently result in serious injuries, but wrecks caused by smaller trucks can also be devastating. According to the Federal Motor Carrier Safety Administration, single-unit truck collisions were responsible for 1,133 fatalities in 2014. Pickups, box trucks, delivery vans, and dump trucks can be involved in many different types of accidents, including head-on collisions, side-swipe accidents, and rear-end wrecks. Pickup trucks. Improper cargo loading or overloading may lead to serious accidents when a driver loses control of the truck or can’t brake quickly enough to avoid a collision. When pickup truck trailers aren’t properly secured, they can detach and cause a catastrophic accident. Dump trucks. In a collision, a dump truck can cause intensive damage to a passenger vehicle and its occupants. Large blind spots limit a dump truck driver’s visibility when backing up, and cargo can easily become unbalanced, making the vehicle susceptible to a rollover. Delivery vans. Delivery truck operators are often rushing to meet strict deadlines, and distracted driving can lead to critical collisions. 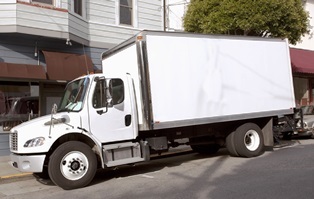 Improperly loaded or overloaded delivery vehicles are prone to rollovers, and delivery drivers sometimes cause rear-end collisions by double-parking. Box trucks. Box trucks often have severe blind spots. Drivers may have difficulty seeing the rear quarter behind the truck, which can cause them to strike another vehicle when attempting a lane change. Since box trucks are top-heavy, taking a turn too quickly may result in a rollover. Settling small truck claims can be complicated, since the operator may not be covered under a commercial insurance policy. If you’re injured due to the irresponsible actions of a small truck driver, you may have to rely on your insurance coverage to recover full damages. An experienced truck accident attorney can evaluate insurance policies to help you best determine how to receive the compensation you deserve. To discuss your claim, contact the law offices of Steve M. Lee, P.C., by using the form on this page.